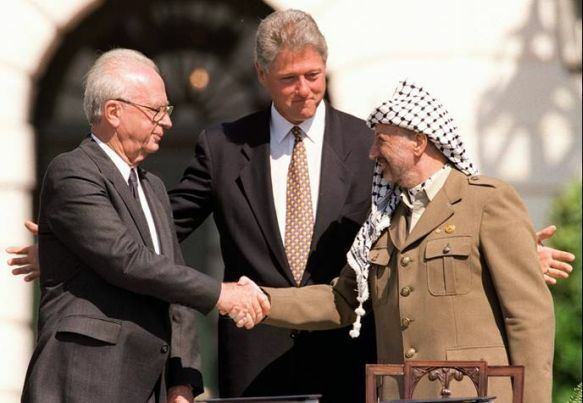 Most commentators are declaring the Oslo accords a failure now that the twentieth anniversary of the famous handshake between Bill Clinton, Yitzhak Rabin, and Yasser Arafat on the White House lawn has passed and the conflict remains unsolved. But in many ways, this criticism is simplistic, the result of unrealistic expectations that were bound to be unmet. Looking at the situation from today’s vantage point, where Israeli and Palestinian officials cooperate daily, it’s easy to forget that when the Israelis and the Palestine Liberation Organization signed the Oslo Accords they were recognizing each other for the first time, and abandoning their relationship as the bitterest of enemies. The world was so shocked by this move that expectations soared to unrealistic heights. Consequently, a widespread assumption developed that since there is no independent Palestinian State, the Oslo accords were a debacle. The problem with this assumption is that it ignores the fact that many of the positive elements between Israelis and Palestinians we take for granted could not have happened without the Oslo Accords. With all of the disappointing developments like settlement growth, the fence, and the missile wars with Gaza, it is worth remembering that the Israeli-Palestinian front is one of the quietest locations in the Middle East today. Remarkably, the complex problems of borders, Jerusalem, and refugees, among others, are still being discussed despite interim periods of violence and turmoil. Despite the recent increase in violence, and unlike the pre-1993 period, Israelis and Palestinians have now had years of working with each other on mundane and critical problems in the areas of security, and economics, and border crossings. Perhaps most importantly, unlike in September 1993, today the notion that a two-state solution is the favored answer is accepted by almost all relevant actors: by the Israelis and Palestinians; by most Arab leaders; by the UN community; and by the United States. Before Oslo, a Palestinian state was considered radical and unacceptable. Israel, the United States, and others assumed that the PLO was an objectionable negotiating partner and worried that the PLO would never accept a state of Israel alongside it. Yet today, the discussions being conducted under the auspices of the US Administration are premised on the idea that there should be two states. There remain serious problems caused by Hamas, Islamic Jihad, and other Palestinian extremists who want one state from the Jordan River to the Mediterranean—destroying Israel. And there are Jewish extremists who also want one state in the same territory, but one that is controlled by Jews. Still, despite these radicals, the notion of a Palestinian state living beside Israel has become conventional wisdom. Polls show that substantial majorities of Israelis and Palestinians, whatever their skepticism and suspicions, would gladly accept the two state solution. This is not to suggest that all problems are resolved by any means; they certainly are not. But both Israelis and Palestinians benefit from a series of conditions that would not have existed without Oslo. The Palestinian Authority that governs the West Bank, as opposed to Hamas in Gaza from which the Israelis have withdrawn in part because of Oslo, have an international standing and an institutional potential that would have been seen as impossible two decades ago. Armed with UN recognition now, they are seen as an internationally recognized potential state rather than a revolutionary and terrorist movement. As part of the current talks, major efforts are being made to enhance the Palestinian economy. For the Israelis, in many ways, the gains have been even greater. During these years, Israel’s economy has mushroomed; the Palestinian security threat is no longer as serious, despite its many ups and downs; and the country’s international standing, while still leaving much to be desired, has been immeasurably enhanced. Israel’s peace treaty with Jordan, a direct result of Oslo, remains intact. Its quiet relations with several Gulf countries, while not officially or publicly recognized, stand as a testimony to the benefits of the Oslo agreement. Are all problems with the Palestinians or indeed the region solved for Israel? Absolutely not. But today—at least with the West Bank—there is a mutual interaction and knowledge that did not exist 20 years ago. The years go by, the crises come and go, and each year there is a certain accustomization to each other that may one day lead to the culmination of the Oslo process.